There’s a random dangerous rightness abroad in this wide shining world. It’s a rightness, not a correctness. We don’t need so much to counter other people’s errors as to bring the light and joy of that right and beautiful world: what we desire for our planet and ourselves. What we are doing instead of hating and denying and bombing. Our job is to work on what we love. Daily. With precision and determination. 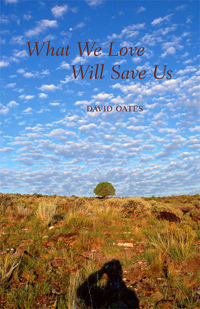 David Oates finds wildness and grace breaking out in unexpected places – from city streets to mountain peaks – offering a crucial balance to his dramatically personal account of what it has been like to be a “citizen of the regime” during eight years of unprecedented propaganda, torture, waste, and war. What is the right response, when the government that belongs to us goes seriously off course? How does a person’s private and creative life relate to the life we share in common? Brief and beautifully intense lyrical essays explore hope, pleasure, and creativity (and the outrage that must never be allowed to eclipse them). Readable, memorable, smart but straight from the heart – these essays give voice to our shared experience of a dark and frustrating time in the nation’s life. They should find a wide audience. – Ana Maria Spagna, author of Test Ride on the Sunnyland Bus: a Daughter’s Civil Rights Journey and Now Go Home: Wilderness, Belonging, and the Crosscut Saw. – Paul J. Willis, author of Bright Shoots of Everlastingness: Essays on Faith and the American Wild. Brief and intense lyric essays, longer explorations: I hope the reader will find these delicious, moving, and (occasionally) provoking. . . Imagine knowing that our fate is each other… Imagine doing what you’re good at and in love with, even if it doesn’t pay so well. That would be like coming back to life, wouldn’t it? What makes a good life in the city? Here we are in the murk of the present. It’s like the fog of war, except that the war is over there and the fog is here. Here in America we’re unable to find our way, frustrated, baulked, angry, guilty. Yelling at the TV. Resurrection isn’t automatic. It takes an act of extreme imagination, steely and wholly unlikely. The lie of power is that it is total and will last forever. It wishes to fill the horizon and blot out all other thought. Resistance, at its core, may be simply remembering that this is indeed a lie, an empty pompous boast. It is the beginning of summer 2007, and no effective voice in America is raised against torture. Democrats quail and fold, unable to find the boldness of fragility. Progressives speak in soundless vacuums. I try to write in hope, but I cannot see what good it will do. I wonder if any of us can be saved. Maybe [these essays] will serve in retrospect as a marker, like what you see in towns that have been flooded: a muddy line on a wall. Perhaps a scrawled message – We were here. This is how high it got. We will need to make poetry of our desperation, as the Founders did. We will have to love our moment, declare our values, and act for the generations. Our collective self is not only a mob, a direct-mail target, an object of self-interest and manipulation. Sometimes we are the instrument of transcendence. Wherever wildness breaks out is grace and a glimpse of the spirit – whether in tangled bank or cityscape – ecosystem or mind, art or music, solitary ramble or solidarity of the plaza. I can’t really say what it meant. But the sage smelled like blessing – resiny, fragrant, unexpected. I can smell it still. I had no idea how much blessing I would soon be needing (no one ever does). Nor how much I would find, stronger than my obtuseness and deeper than any jargon or borrowed mysticism: blessing woven it seems right into us, and into all the world besides.